The Emerald Cockroach Wasp is quite the little troublemaker. Although it has beautiful shimmering blue and green colours on the outside, it is masking a malevolence that lies deep beneath its exterior. These wasps are known for using cockroaches as semi-living hosts to their unborn children. 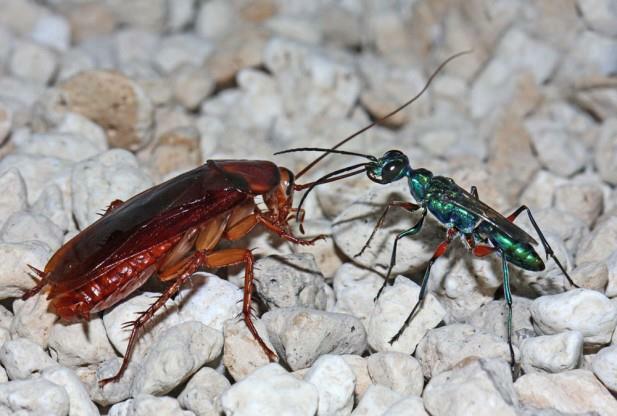 How can an emerald cockroach wasp win in a battle against the common house roach (after all, there is an obvious size difference between the two)? 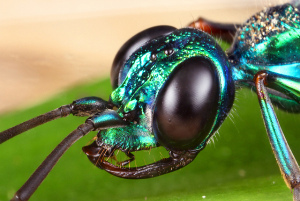 Fortunately for the wasp, evolution gave rise to the development of a deadly neurotoxin that ensures that the species is able effectively secure the survival of its offspring. Once the wasp scouts our her prey, the female Emerald Cockroach Wasp delivers a blow to the abdomen of the cockroach, this temporarily renders the legs of the unlucky creature paralyzed. Following this, the wasp then delivers another blow ,that is full of neurtoxin, directly to the roach’s brain (into the sub-esophageal ganglia, to be specific). Now, this doesn’t kill the cockroach. They can’t die just yet, as the wasp still needs the creature to carry her eggs to fruition. Not that the death part matters though. 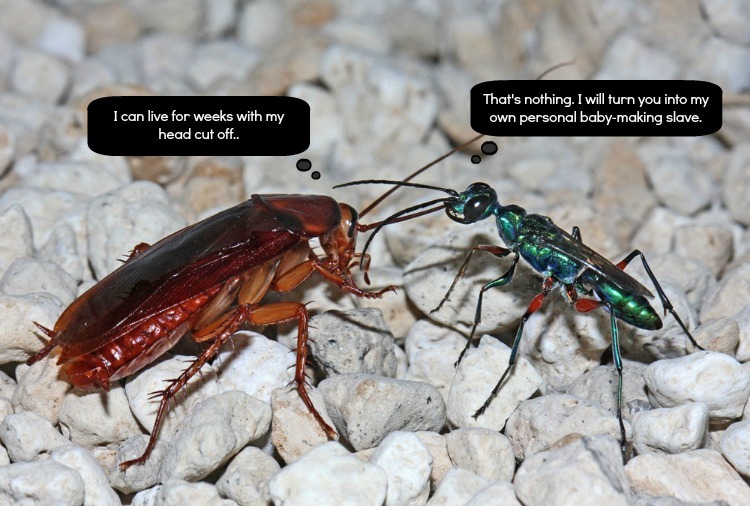 The second blow to the brain essentially takes away the free will of the cockroach. Due to the venom, the cockroach no longer feels the need to escape, so it is led around by the wasp by its antennae. The wasp leads the cockroach to her burrow and lays her eggs on its legs. During the following month, the cockroach remains still and obedient while the larvae hatch and mature inside the cockroach host’s body… then they proceed to eat their way out of the host (much like the bursting-through-the-chest scene in “Alien,” only on a much smaller scale.) Then the cycle starts anew. The wasps also produce a mix of antimicrobial compounds, which prevent the spread of things like fungi, bacteria and viruses—things that could cause the hosts to rot before the larvae emerge. It also plays a role in “purifying” the infamously dirty species. Needless to say, its evolutionary design could prove invaluable in the field of medicine. Think this is cool? Learn about undead ants. Can Two Snowflakes Be the Same? Black Hole at the Center of Orion?